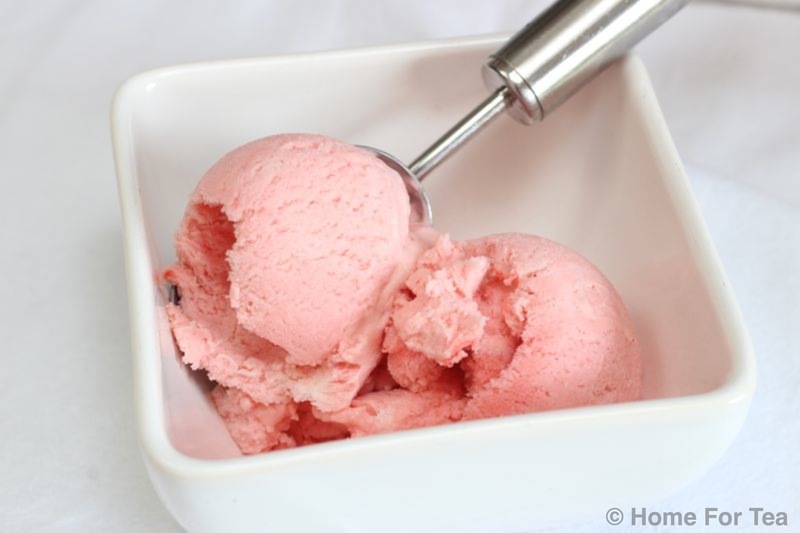 There is nothing that tastes more like Summer than the classic simple combination of strawberries and cream and this is exactly what is in this delicious homemade ice cream. No ice cream maker needed just simple ingredients and time! The bad news is you have to wait for it to freeze before you can tuck in. Delicious on its own of course or with some fresh strawberries. Hull and roughly chop the strawberries. Purée them with the lemon juice in a blender or food processor. Push the purée through a sieve to remove the seeds and set aside. Place the sugar and water in a saucepan, and heat slowly, stirring to dissolve the sugar, then boil fiercely for 5 minutes. Meanwhile, using an electric whisk, whisk the egg whites with the cream of tartar until stiff. Keep checking the sugar & water mixture which should have thickened and is ready when you dip a spoon into it and the last few drops off it form a thread. Gradually pour the hot syrup in a thin stream into the egg white mixture and continue to whisk until the mixture is cool, glossy and stiff (about 4/5 minutes). Fold in the strawberry purée and the whipped cream, though not completely to give it a nice marbled effect. Can be scooped & served straight from the freezer. do you think I could make it without a whisk of any kind? would a fork work? seriously. I want to make this. Hi Liz, you could try but it would need quite a bit of elbow grease and patience as both the cream and the egg whites need to be whipped. I used an electric whisk for both.